(TibetanReview.net, Feb06’19) – Australia has stripped a Chinese billionaire of his permanent residency permit, rejected his citizenship application and banned him from returning to the country following allegations of buying influence for China through political donations, reported the AFP Feb 6. Huang Xiangmo, a property developer, has donated millions to Australia’s two main political parties and is now under scrutiny for alleged links to the United Front Work Department, a Communist Party organ accused of neutralising opposition and buying political influence around the world, the report said. The report said Huang, founder of the Chinese property developer Yuhu, was left stranded outside of Australia on Feb 6 after Home Affairs cancelled his permanent residency and rejected his application for citizenship. 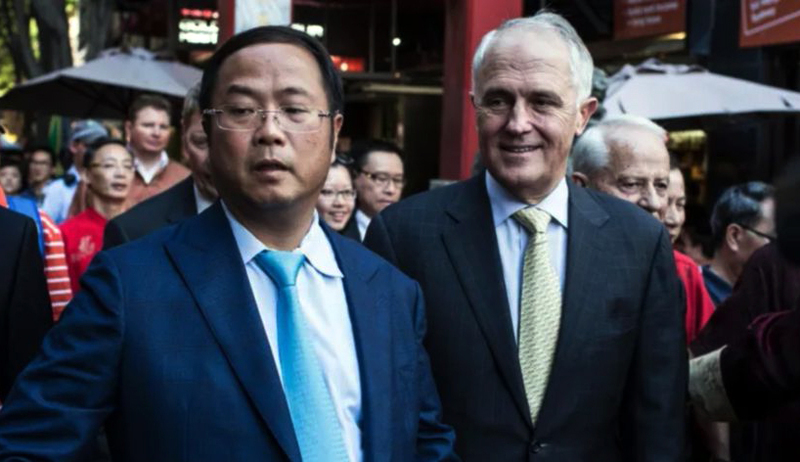 Along with donations, Huang has been photographed with key political figures in Australia, including former prime minister Malcolm Turnbull and opposition leader Bill Shorten. Prime Minister Scott Morrison has refused to comment on what he has called a “sensitive matter”. Asked about money Huang had donated, Morrison has referred to the law introduced to ban foreign donations. “The actions we’ve been taking in relation to this gentleman, that’s based on information that exists today,” he was quoted as saying. Huang’s application for an Australian passport was stated to have been blocked on “character grounds” and concerns over the “reliability” of information he had supplied in interviews. Australia’s Foreign Minister Marise Payne has played down suggestions the decision to strip Huang of his residency could poison relations between Canberra and Beijing. The report noted that while the two countries’ economies were deeply intertwined, conflicting political systems and China’s increasingly strong-arm tactics in the Pacific region had made cooperation more difficult. The report said Australia’s main spy agency had long voiced concerns that China was interfering in Australian institutions and using the opaque political donations system to gain access. It was stated to have warned the country’s political elite about taking donations from Huang – who owns a multimillion-dollar mansion in Sydney – and a fellow billionaire property developer named Chau Chak Wing. The report noted that in 2017, one-time opposition Labor power broker Sam Dastyari was forced to quit politics when it emerged his office took cash from Huang to pay legal bills. The report noted that Canberra last year introduced sweeping reforms to its espionage and foreign interference laws, strengthening existing offences and introducing new ones targeting foreign influence on domestic politics, including a ban on foreign donations to political parties. “Foreign adversaries are actively working against Australia’s interests through a variety of means, including obtaining classified information or seeking to influence the outcome of Australia’s democratic processes,” the government was reported to have said upon passing the laws in June.